This weekend I made it to the Karibukai Animation Festival. I say “made it” because it was raining constantly this past week and I waited until the very last day of the festival for drier weather. I got the chance to meet Carlos Goméz Nicolás (Nikodemo), creator of the funny animated series from Spain Cálico Electrónico. Niko was freshly arrived from a (wet) tour of El Yunque rainforest. Poor guy came to normally sunny Puerto Rico and barely saw the sun. He was nice enough to autograph stickers of his Cálico series for free. Cálico Electrónico is about a short chubby janitor/superhero that fights (or tries to fight) bad guys in Electronic City. Some videos the Cálico website are dubbed into English so if you can’t understand Spanish you’re in luck. I saw Dig Comics, a pro comic book reading documentary with writer/director/host Miguel Cima (of Argentinean heritage). From what I saw, Cima is very much a comic book fanboy and this documentary is a labor of love. Made me smile. There was a second documentary about comic books called Comic Book Literacy. It was a longish but very educational. I learned something of the history of comics in the United States. Of the Japanese anime I saw, I found Gundam Unicorn to be the most interesting and will be looking for the DVD. I hadn’t seen any robot anime since Voltron. I thought it had ruined me for anything else. 1st place ($250) and Viewer’s Choice award ($150). Fried, Elena Montijo Capetillo. This was a cute dark humor story about a little girl who loves her chickens but each bird is a bit crazy (and the girl too). I voted for this entry because it was the one I liked best. Having it created by a woman was a nice bonus. Check out her promo video at the link. It shows a bit of the winning short starting at 0:37. 2nd place ($200). 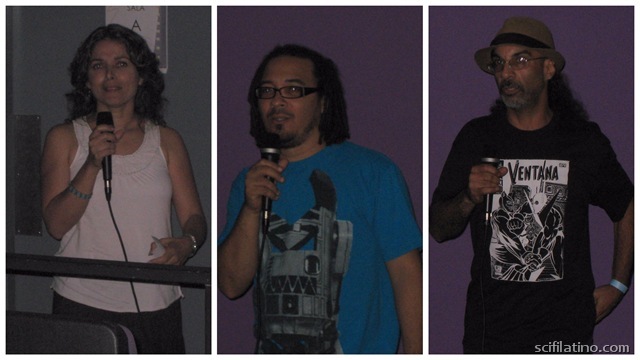 Boricuas Beyond: Happy Hour, José Luis Collazo. This animated short from the Puerto Ricans in the future series Boricuas Beyond was the one I least enjoyed. Although the animation is excellent, I didn’t like the crude humor. It uses local pop culture and slang heavily so it would be hard to get if you’re not a Puerto Rican living on the island. 3rd place ($150). Ventana, José Vázquez. I’m not sure Ventana was a story, it was more like a look at past and future Puerto Rican cartoon characters, some corporate logos and others from comics and webseries. Vázquez also presented a short called Mad Taíno about a native couple who fight Spanish conquistadors. I really hope more animators and film producers participate in future Karibukai events. It’s great exposure and the money isn’t bad either. Here’s to next year not having such foul weather that keeps people home. I really enjoyed the event and hope the Karibukai Festival will become a yearly tradition. Recently I received a press release with interesting news about an animation festival that will take place for the first time in Puerto Rico next weekend. 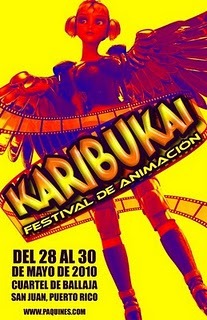 Here are the details: The Karibukai Animation Festival will take place from May 27th to the 30th at the Puerto Rico National Filmotheque in the north wing of the Cuartel Ballajá, near the San Felipe del Morro Castle in Old San Juan. Karibukai will feature full-length animated films along with a contest for local animated shorts. According to their website, Karibukai is the Japanese word for Caribbean. 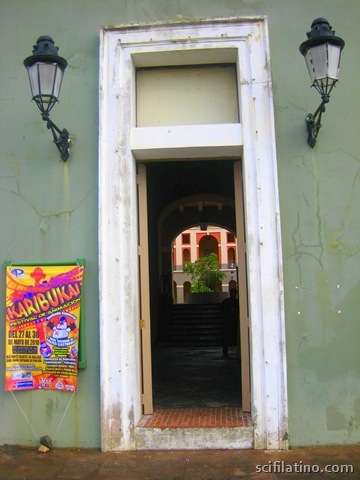 Karibukai is organized by Paquines, a nonprofit organization bringing animation, comics, and film fans together in Puerto Rico. Check out the Karibukai official website for more details, film listings, and contest info. I’m looking forward to checking the festival out so if you can’t be in beautiful Old San Juan next weekend, I’ll let you know what went down. 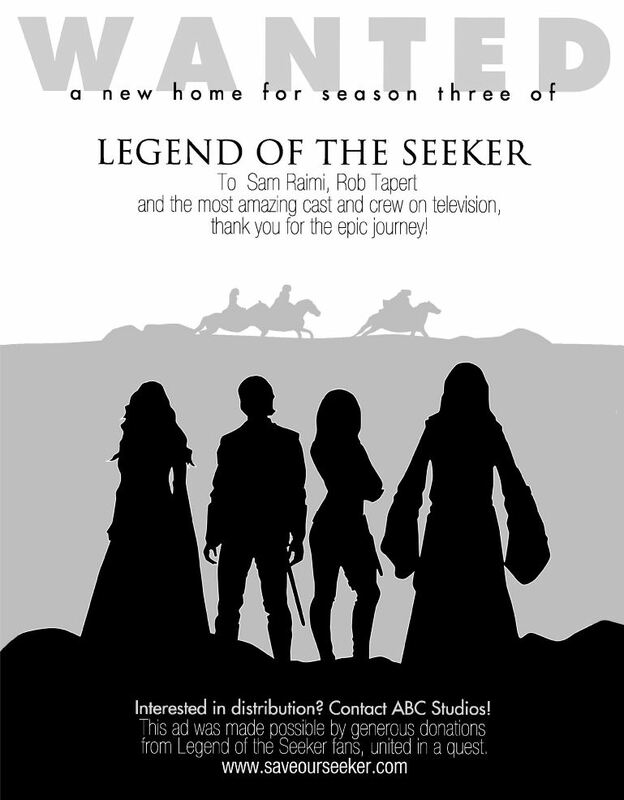 Recently Karen Méndez of IBG Inc. contacted me about the Legend of the Seeker renewal campaign. She is co-organizing efforts to bring about season 3 of this ABC series based on Terry Goodkind’s Sword of Truth book series. I personally love the show; it is beautifully filmed in New Zealand and has an excellent cast. It would be a shame to see it cancelled after only two seasons. Check it out if you like fantasy epics like me. The Save Our Seeker campaign gathered enough funds for advertising in top industry magazines Variety and The Hollywood Reporter– a feat that any TV show follower who’s been in a fan-driven movement can appreciate. The campaign is now bent on making sure as many public libraries as possible have the Legend of the Seeker DVDs. Their DVD campaign will end on May 30, so donate now. If you’re already a fan, there’s no confession necessary. To date, we’ve published the two ads. There’s also a wide range of other campaigns in conjunction from fans coming together trying to do anything and everything to save our seeker. We email and snail mail to various networks, as well as ABC/Disney. We also have significant ‘Legend of the Seeker’ related items sent in, along with the letters. One of the biggest boosts we at “Save Our Seeker” have had has been the support of Terry Goodkind, best selling author of the ‘Sword of Truth’ book series which the show is based on. He has graciously offered to collaborate with the “Save Our Seeker” campaign and we are currently working with him to launch a new campaign in the next day or so. The season finale is [this] week and we hope to change our current situation to an announcement of ‘Legend of the Seeker’ being picked up for a third season. All of us Legend of the Seeker fans wish the campaign every success. We’d love to continue the adventures of Seeker Richard Cypher, Mother Confessor Kahlan, Mord Sith Cara, and Wizard of the First Order Zeddicus. Find a way to support the campaign- its website SaveOurSeeker.com has several ideas on how to do this. This weekend the Puerto Rico Comic Con (PRCC) held its annual two-day event at the Puerto Rico Convention Center in San Juan. I visited on the first day. The PRCC is a small convention that is almost entirely a huge dealer’s room with comic book and toy vendors. Their best feature is that the local comic book and manga artists come in person with their new material (which they all signed for the price of the book). It was great meeting them; you could tell they love what they do. Most attendees were teens and young adults interested in anime and manga, a growing trend on the island. There were plenty of cosplayers at the event along with game tournaments and a few out-of-town guests. These included Twilight actor Chaske Spencer, anime voice actor Spike Spencer, and comic book artist Michael Golden. 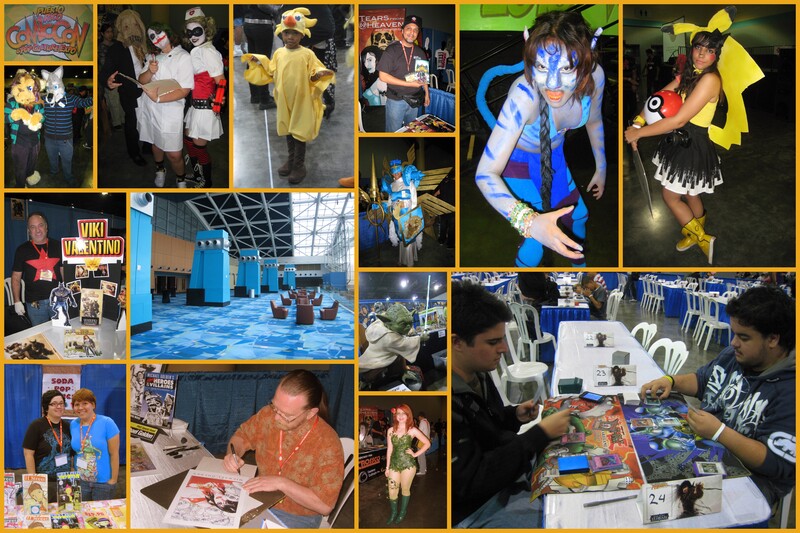 Hopefully next year the convention will add more panels and have an event schedule and booth map available on site. There was only one panel with Chaske Spencer limited to 300 people a day, and it cost an additional $40 to get in (daily tix were $16). So most attendees never saw the arguably biggest star of the event, and that’s a shame. While not being a Twilight fan, I would have gone out of curiosity and who knows? Maybe I would watch the movies if I was charmed by one of the actors. Spike Spencer did have a Q&A session but it wasn’t moderated; it took place in the main dealer’s room so it didn’t have the greatest sound quality. However, the actor did his best to answer questions and entertain everyone so- disaster averted. I got the latest local comic books and talked to many artists, so in future posts I will share my thoughts about the books and whenever possible, interview the artists and writers. 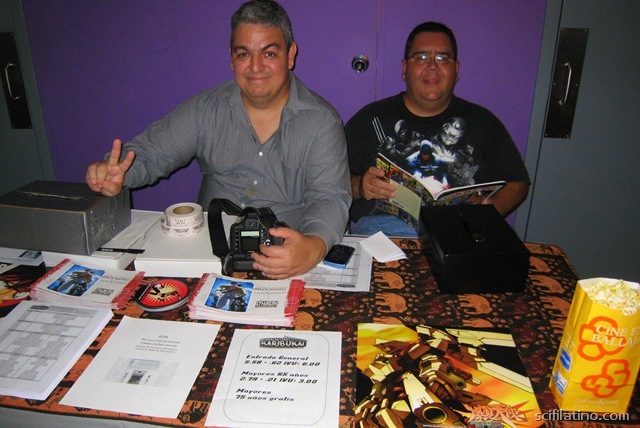 I’ve posted pictures of the event on the SciFi Latino Facebook page. UPDATE 4/26/2010: More event photos by attendees at the Paquines.com and Cinemateria forum. You must register to see them, but it’s free. Click here! Admiral Adama and President Laura Roslin visited Spain this past weekend and shared the BSG love in an intimate gathering of 350 250-300 fans. Some of the fans (around 80) came all the way from other countries, so BausauriCon had an interesting mix of international Colonials. Compared to other mass conventions, it looks like this one had a perfect number of attendees that allowed Olmos and McDonnell closer contact with their fans. BasauriCon 1.0 was organized by The 13th Tribe Science Fiction Fans Association, and was supported by the city council of Basauri. Always nice to see fan-organized events be a success. EDITED 2/10/2010. Unfortunately the video I had linked here has been removed. The BasauriCon Facebook page has a wonderful assortment of fan pictures. Also, a fan has put up several vids of the on-stage portion of the event here on YouTube. The Freakytown podcast from Sevilla did a live cast at BasauriCon (Spanish). They interviewed one of the organizers who said they had 250-300 guests from Spain, Canada, England, Hungary, and the United States. Then they interviewed Mary McDonnell (at 42 minutes, English) and Edward James Olmos (at 56 minutes, Spanish). Mary McDonnell talked about her career, going to the Oscars, being cast as President Roslin, and future projects. EJO talked about working with troubled youth, not romanticizing crime, editing The Plan, working with his family, and several future projects. All in all great stuff and I learned about a new podcast!